New, 1.5 HP. All Stainless Steel Meat Grinder. For Big Game Hunters, restaurants, butcher counter, pet owners/food makers or Food Service Professionals ! 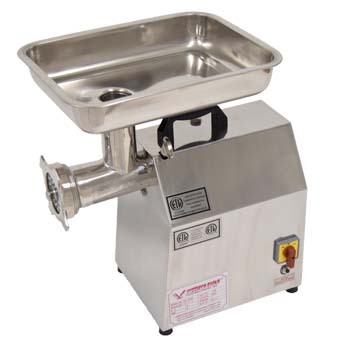 100% Gear driven transmission, 100% Stainless steel food surfaces, casing, cylinder, worm, adjusting ring, feeder pan. * Forward/Reverse direction switch & Overload reset. Has Reset Button To Reinstate Power. # 22 Hub, 450 LBS./Hour Productivity, Blade Speed 170 RPM, 1.5 HP. Permanently lubricated gear box. Precision milled heat treated steel alloy gears. The Chute Is 2 1/2" Wide. Approx. 115 Volts, 60 HZ.,1 Phase, Weighs 120 LBS. 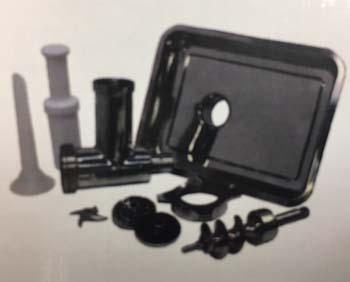 Comes with: stainless steel feeder pan-Feeder pan measures approximately 16 x 12 x 3. For extra safety, feed chamber opening measures 2.5 in diameter. Warranty from American Eagle is: Parts 1 Year Labor Only warranty from AE. Must mail in warranty registration card ! or AE-MC12NH meat cutter head, Hamburger Patty Press AE-HP100-4".